Come join us at the All In! Young Writers Media Festival and explore the creative and career opportunities for writers in the new media. If you are in a secondary school, Junior College, ITE, Polytechnic or enrolled in any tertiary institution or just a young person who aspires to be a writer or interested in some aspects of writing and publishing this is the Festival to attend. We have various sessions on social media, e-book publishing and e-book stores, writing, transmedia and much, much more! The programme has been specially organised with you in mind. This event is suitable for students age 16 and above. With such an exciting line-up of talks, workshops and forums, we are sure this event will be a blast. We hope to see you there! Seats are limited! Sign up fast! Evening Of Poetry & Music 2012 – Register Now! It’s that time of the year again! 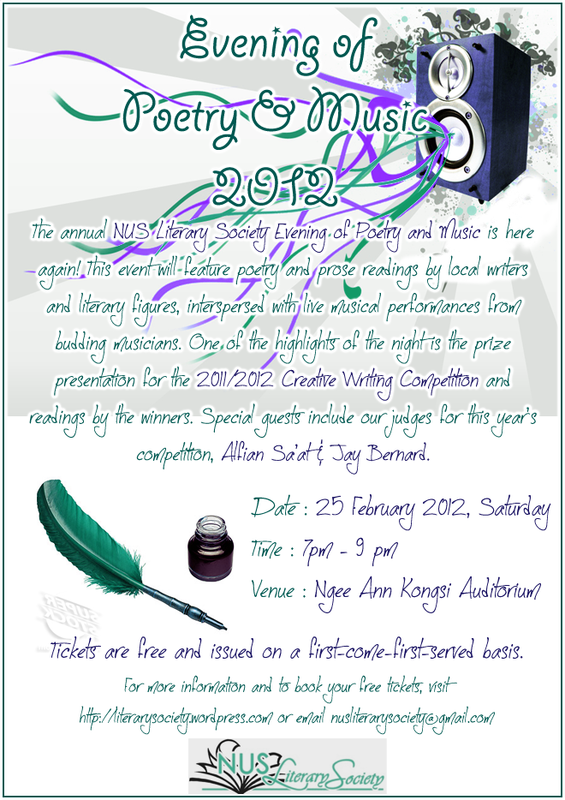 The NUS Literary Society will be organizing the Evening of Poetry & Music 2012 and all are welcome to join us! The EPM will feature distinguished literary figures from the local scene as well as musical performances from NUS music groups, including NUS Resonance (acapella). Highlights of the event will also be the prize presentation ceremony for the winners of the Creative Writing Competition 2011, and a reading by the winners. Refreshments will also be provided. Admission is free of charge. However, interested participants should register for the event by filling in this form. A confirmation e-mail will be sent to you, and it will serve as your ticket for admission into the venue. If you have any inquiries regarding the event, do leave them in the comments section below or e-mail us at nusliterarysociety@gmail.com. Do let your friends know about the EPM! We hope to see you there!